I think they showed me their crack pretty well. They want to look like bigots who want people like me dead, I'll make a point of spending my money elsewhere. If we don't learn history, we'll repeat it. And it certainly looks like someone forgot the lessons that should have been learned from the Third Reich. Ugh. I feel so slimy after seeing this. I would not have thought "Nazi Plumber" would be a successful marketing niche, and yet humanity manages to disappoint me once again. No question about it. That stylized eagle is an exact match, give or take the plumbing tools. 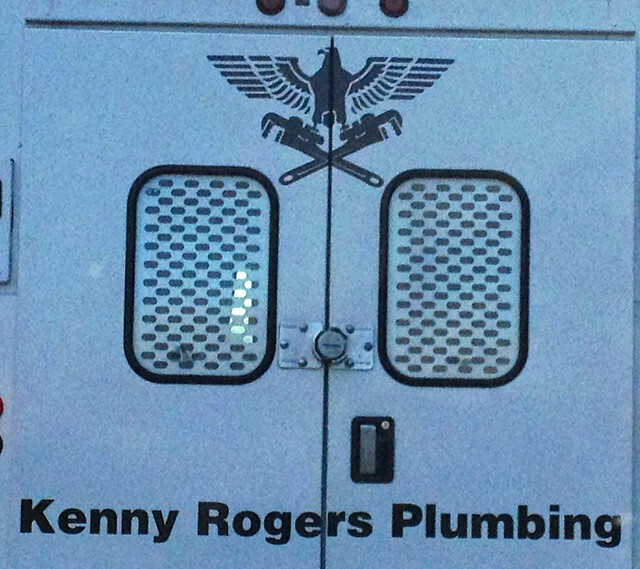 I called up and talked to Kenny Rogers and asked him where he got the eagle for the logo. He said it was a military eagle and that his brother and another relative were in the service and designed it for him. He assumed this was a trademark call and asked me if I had something similar. I told him that the bird appeared in the Nazi symbol and he sounded genuinely surprised and doubtful. I suspect the designers would be less surprised. I suggested he look online at the Nazi image and called it "something to think about." He thanked me for the call. I can't tell whether he'll really follow up. Given that the owner is answering his own calls, I'm thinking this is a one-man shop, or close to it. My first reaction upon seeing this was, "Maybe the owner doesn't know." He could have copied a copy of the Nazi symbol, or the logo could have created by a designer whom he told only, "I want an eagle carrying tools." The appropriate thing would be to alert him to the problem and see how he handles it. Every time I see that eagle, it's a gut punch. I really, really, really hope dude just didn't know.